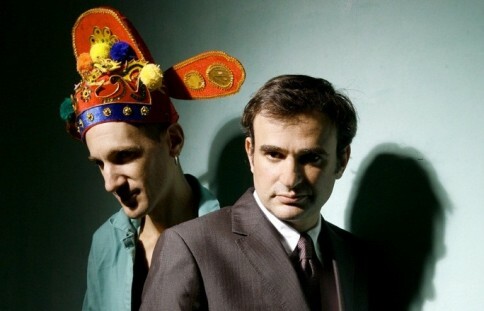 Many bands and artists embrace eclecticism. 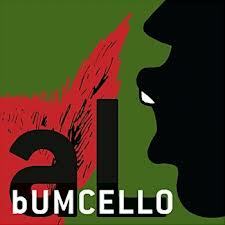 However, the band Bumcello has eclecticism encoded in their DNA. 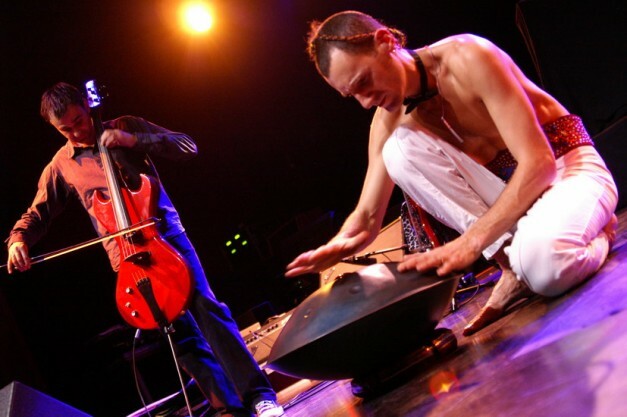 The core of Bumcello is a duo consisting of cello and percussion. These two instruments may seem like strange bedfellows. But, sometimes strangers in bed have the most exciting chemistry. The thumping, beating heart of Bumcello is Cyril Atef ; a master percussionist whose been around the block musically and around the world literally. He’s a French-Persian born in Berlin. He has studied music at the Berkeley Institute, and played in punk bands in the San Fernando Valley. Vincent Segal is the electric cellist. He began classical studies from the age of six, joined the National Academy of Music in Lyon, France and passed his exams there before accepting a grant to persue his studies further in Canada. When he finally visited America he started absorbing the cultural diversity quickly. He started branching off into outsider art and more abstract forms of music, his credits include session work with artists ranging from Elvis Costello to Hip-Hopper Eric Bobo. Think “Cello” and you think about a very fixed and constipated range of timbres. However, the cello in Bumcello spends very little time sounding like a cello. Mostly it sounds like a synthesizer, squalling feline, or something else entirely. And because it is also occupies much of the down-low terrain of the sonic landscape, the new album “aL” is refreshingly absent the blunt force trauma that deep bass grooves often inflict on loop based music. It’s not often that bands can incorporate elements as disparate as Jazz, Rock, Pop, Classical, Hip-Hop, Afro-beat and Reggae while maintaining a rock-ribbed commitment to the sanctity of each. It takes a rare virtuosity to pervert pure forms into a satisfying whole. There are many bands that lift stylistic quotes from different continents and genres to spice up their muse. But too often it’s like a pastry chef trying his hand at Vietnamese cuisine. The result might be interesting but unconvincing. Conversely, when I hear Bumcello’s music, I believe. However, Bumcello has an achieved a richer form of fusion in both style and execution. On “aL” the basic source material is as organic as you could want. Percussionist Cyril Atef jammed with cellist Vincent Segal in the studio. The result was 13 hours of improvised music. That was the starting point. Following the 13 hour marathon jam session, “aL” had a one year digital gestation period where the multi-track, real-time improvisations were under the custodial care of producer/guitarist/singer Tommy Jordan. The process at this point is shrouded in mystery. All we know is that this organically improvised music was sliced, spliced, diced, cut, pasted and remixed into 12 songs. Vocals and lyrics were added after the fact. The result is a rich, detailed (yet oddly accessible) collection of bionic pop tunes. Jacaranda – nice spacy, looped groove with a syncopated brush-back beat. Perfect gateway tune to the rest of the album. Cowboy Engine – Unpretentious and playful. Guitar makes a rare appearance with some urgent, echo drenched chords in the lo-fi manner of Daniel Lanois. How to Ride – Probably the most commercial and fully realized tune on the record. Attractive pizzicato cello played bossa nova style is accented by djembe and discreet percussion and guitar. Time Bum – Nice restrained instrumental. Spearheaded by Atef’s syncopated drum beat and Segal’s bass line. Lot’s of background atmosphere. Catchy with a dash of dissonance. Cello Laugh – Segal manages to coax some truly strange sounds out of his electric cello. A solo cadenza that is reminiscent of Jon Hassell’s work in the 70’s with Brian Eno. Only Now – Killer guitar hook; wailing cello, and gentle, comforting vocals make this a standout track. Je Ne Sais Quality – Drummer Atef steps up with a meaty beat and adds some nice stabbing horn riffs on melodica as well. Hip and funky. Great mid-tempo dance groove for when the party is (almost) over. Bows and Horses – Travelling music. That is, if you’re travelling horseback through the Sahara desert at midnight. Nice Arabic riffing by Segal. The heavily processed drums and percussion by Atef bring to mind the micro-beats of outside-artists Matmos. Changing Everything – Downbeat mood piece. With lot’s of atmosphere and a high register pop vocal. Below Low – This mournful instrumental exploits the classic sound of the cello. Cyril Atef somehow pushes the envelope while remaining firmly in the pocket. It’s meditative, hypnotic, yet the piece develops and goes places. The off-kilter drumming, the tonality of Segal’s cello and rubbery bass figures bring “Larks Tongue In Aspic”….. era King Crimson immediately to mind; except better. Wet – The only track on “aL” that ventures anywhere near American music forms. Specifically, soul and R&B. Funky, accessible, yet outside the box. Truly inspired middle section solo as well. Little Death Dance – This closing tune brings the album back to its origins. Cello and Drums jamming in real-time. Perhaps, a little window into the 13 hour marathon jam session that was the original source material for “aL”. Despite the bracing originality of “aL”, one does hear echos of the familiar (intentional or not). I would be surprised if someone in Bumcello isn’t a big fan of The Clash and their space-dub excursions on “Sandinista”. And vocally, Tommy Jordan has a very pleasing, conversational pop voice that faintly echos Robert Wyatt’s keening tenor with a dash of David Sylvian’s caramel smooth croon thrown in for good measure. But, these are comparisons for those of you who need such things. The most accurate description of the music on “aL” is Bumcello music. Bumcello has a lot to say, all of which you need to hear.